Lisa Miller driving Quackers, owned by Elle Weisfeld. Photos by: Provided by Diane Kastama. Howell, NJ – August 20, 2013 – United States Driving for the Disabled, Inc. (USDFD) hosted a successful free driving clinic at Celtic Charms Therapeutic Horsemanship in Howell, NJ on August 10-11, 2013. Sponsors for the Para-Equestrian Developing Driver Clinic included the United States Para-Equestrian Association (USPEA) and United States Equestrian Federation (USEF). The Para-Driving clinic is held in conjunction with USDFD, USPEA, USEF, Celtic Charms Therapeutic Horsemanship, and Ann Miles of the Carriage Barn in New Hampshire. The clinic was for all levels of drivers and included clinician Sara Schmitt. The clinic provided instruction in driven dressage, hazards and cones and lessons were adapted to the skill level of each driver. The Para-Equestrian Driving Clinic was a raging success. There were 8 driving lessons on Saturday and 7 on Sunday, August 11. There were 9 participants over the course of the weekend and 2 Para-Equestrians were Nationally classified. All the drivers and potential drivers used provided horses and ponies. Borrowed horses/ponies included: Wilbur, a Halflinger, and his Glinkowski 4-wheel carriage loaned to the program by the Neuberg’s at Nearaway Farms; Quackers, a Standardbred, and his Meadowbrook cart loaned by Ellen Weisfeld and Mary Alice Goss; Misty, a Halflinger pony, owned by Celtic Charms and Nancy Forsyth’s Pacific Cart; and clinician Sara Schmitt brought her own competition horse Savanah, a Frisian Saddlbred Cross mare, used by the advanced para-equestrians. Saturday, August 10, started with pairing drivers with horses and carriages to figure out what would work best. There was a cones course of 10 FEI cones setup and Sara Schmitt worked with each driver on steering accurately through the cones and working on getting the horses to go forward and straight. Ann Miles worked with many of the beginning drivers on the basics of driving straight. This was executed by following a young man, Josh, who jogged the cones course in front of them. Sunday, the drivers were introduced to a hazard and another cones course where the beginners drove gates A, B, and C and the more advanced A, B, C, D. Diane Kastama and Sara Schmitt discussed how to drive hazards and take into consideration the ability to turn left or right depending on one’s own disability. The clinic was very successful resulting in 4 para-equestrian riders who are hooked on driving and want to continue to pursue the sport of Combined Driving. Our most advanced driver worked on her cones skills and hazard skills to help her in her future shows at the Intermediate level in Open competition. 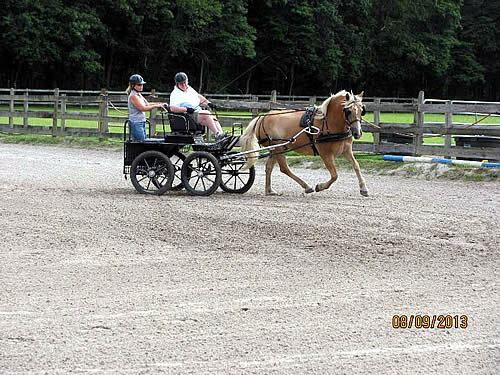 Many drivers were enthused to see how fast they could drive and plan to continue their instruction at Celtic Charms Therapeutic Horsemanship center. For more information on the Developing Drivers Clinic in Howell, NJ, or to make a donation to support USDFD’s efforts, please contact Diane Kastama at dkastama@verizon.net or call 805-343-6026. Contact Information: Diane Kastama at dkastama@verizon.net or call 805-343-6026. Host: United States Driving for the Disabled, Inc.
About the United States Driving for the Disabled, Inc.
United States Driving for the Disabled, Inc., a 501(c)(3) non-profit organization, seeks to improve the lives of physically challenged individuals throughout the United States and Canada by providing the experience of driving horses in a safe and challenging environment. Our mission is to provide the extraordinary benefit of therapeutic driving to as many people as possible through sharing knowledge, experience, and serving as a resource for innovations in adaptive equipment for drivers, trainers, and programs offering carriage driving. The Sybil Dukehart Memorial Fund seeks to provide financial assistance to equip and train disabled drivers through providing scholarship funds to applicants. USDFD fosters opportunities for drivers to compete in national and international amateur competitions by training and providing financial support for Team USA. United States Driving for the Disabled, Inc.
To view an online version of this press release with more photos, please visit: http://uspea.org/category/recent-uspea-press-news/.